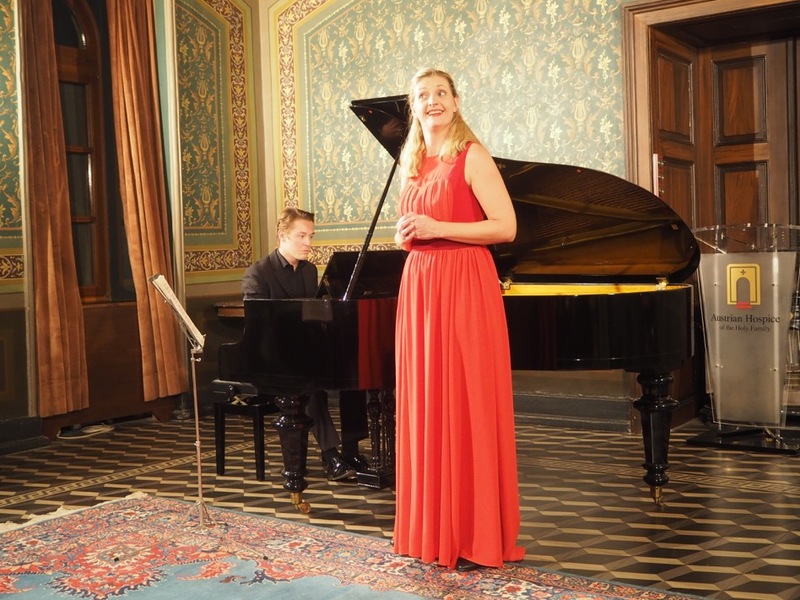 “A Journey Through Time” was the theme of an Advent Season Concert performed by mezzo-soprano Annette Lubosch and pianist Ingmar Beck in the Imperial Salon of the Austrian Hospice of the Holy Family, Jerusalem, on December 2nd 2017. Ms. Lubosch, known for her versatility and lively personality, introduced the concert by saying that, inspired by the colour and variety of Jerusalem, she wished to be seen as a “wanderer” through the different items of the evening’s program. Also telling of gypsies and cruel trickery, the two artists’ performance of the eerie Spanish traditional song “Hijo de la luna” (Son of the Moon) was vibrant, emotional and dynamic. Annette Lubosch’s competence in the genre of musical theatre was displayed in her attention to detail and gestures, her humour and the touching, communicative renditions of numbers from “My Fair Lady”,”The Sound of Music” and “West Side Story”. Following Adolphe Schlösser’s rather pedestrian “He that keepeth Israel” (Psalm 121), surely one of the German/English composer’s less inspiring pieces, we heard a selection of Christmas songs, beginning with a sensitive performance of Engelbert Humperdinck’s “Weihnachten” (Christmas), with Ingmar Beck’s delicate accompaniment adding to the song’s sense of well-being. After “What Child is This” to the Greensleeves melody, the artists gave a hearty reading of a traditional Austrian Christmas carol (sung in Austrian dialect) and a lively, sentimental and touching presentation of “Have Yourself a Merry Little Christmas”, a song written by Hugh Martin and Ralph Blane, introduced by Judy Garland in the 1944 MGM musical “Meet Me in St. Louis”. This concert was the first collaboration between the two artists. Ingmar Beck, today highly active as a conductor, added much to the evening’s enjoyment and musicality with his accompaniments. A nice touch to the evening was Annette Lubosch’s reading of a few poems. In a program hosted by Rector Markus St. Bugnyar and the Austrian Hospice, Annette Lubosch, Ingmar Beck and contralto Veronika Dünser were also here to give of their time to tutoring local young people.